Been a while since we've had a spot of knife pr0n* on the blog, but while I was researching some Scottish folklore for another project I stumbled upon this handsome little fella. The Sgian Dubh (say it Skein Du) means 'knife dark' in the celtic tongue and is traditionally worn poking from the top of a long woollen sock. There are several schools of thought on the history of the SD, with some commentators seeing them as the smaller half of a pair of field knives worn by a Gillie or guide. Others claim the design comes from an earlier concealed carry that was worn inside the sleeve of a shirt or jacket. An overlapping theory has it that the Sgian Dubh found it's place in the Caledonian tradition as the only EDC permitted after the disarming act of 1746. 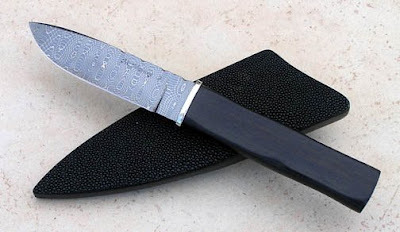 The vast majority of Sgian Dubh seen on the web are purely decorative and part of highland formal dress - basically, they're purely ornamental and you wear 'em at weddings. For locations were there is a prohibition on the wearing of small daggers while copious amounts of alcohol are being consumed one company has launched the Sgian-Brew. This example is a totally different story: a 4" blade of Devin Thomas "spirograph" damascus which has been gun blued, given a nickel-silver guard and stabilized ebony handle. It was made by a chap called Mike Mooney of Queen Creek AZ who has won numerous awards for his knife making skills. Have a look - you'll see why. PS If you thought custom knives were expensive - wait 'till you see the price of Kilts!!! *knife pr0n = knives that I'd like to get my hands on but likely never will.